I started Tae Kwon Do when I was only 3 1/2 years old. Ever since then, I have been learning numerous different ways to defend myself, should the need ever come, through the forms, techniques and sparring methods that we are taught. 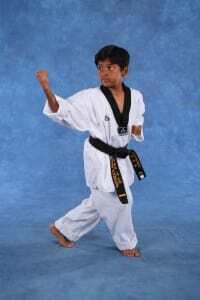 Tae Kwon Do has also taught me discipline and helped increase my physical strength and stamina. I love Tae Kwon Do and would definitely recommend it to anyone! Andrew looks forward to his lessons with Grand Master Hong and Master Joseph. We signed up for the program after 3 very positive reviews from classmates. Classes are a good balance of instruction with patience and discipline. As a parent, I also appreciate the emphasis on respect and manners. If you are looking for an EXCELLENT place for your child to learn the art of Tae Kwon Do, I highly recommend Grand Master Hong and his team. Master Hong truly cares about his students. He is a true Master at TKD but also teaches the kids life lessons as well. You walk in the door of Anthony Hong Tae Kwon Do a person, you leave a well-trained FAMILY member. We love the Hong family! All at Anthony Hong Tae Kwon Do lead from the heart. They not only teach your kid how to defend themselves using the art of TKD, they teach them to believe in themselves and to become the best version of themselves in whatever they do.